After many hours of troubleshooting, and then two calls to Apple Help, my new iPod Touch 3G is officially pronounced DOA. What happens is that it has no problem connecting with a Wi-Fi network, but seconds later downloads stop. The status bar shows that there is an active connection, but no packets are received. I tested this both on my home network and the local library's Wi-Fi network with the same result. Apple will be shipping me a new one, as soon as I can send back this lemon. I received my iPod Touch 3G yesterday, but now I have to return it because it loses the Wi-Fi connection after a short period. But, it did get here in a hurry. You can see by the FedEx tracking table here that it made its way from Kunshan, China to Springfield, MO, by way of Anchorage, in two day's time. I told the FedEx delivery person that I thought this was amazing, and he said that he checked the main tracking number just to see how many were being shipped (per day?). He said he stopped at looking when he reached 50 pages of shipments, with each page holding 50 items. I said there must be a dedicated plane just for shipping Apple devices, and he said that the entire shipment is cleared through customs while the plane is in the air. So far, I notice improved performance of the last 2G iPod Touch I owned. The games load and play faster, working more reliably. I downloaded the Kindle reader, and for me, this beats the Kindle without a doubt. It's the perfect second device (I don't need another digital camera), plus I won't have to drain my smart phone's battery. UPDATE: As it turns out, people are having problems with the iPod Touch and Wi-Fi. My previous two Touches worked perfectly with my home WPA2 secured network. I was able to listen to music using Pandora with little or no problems. I even went to the local library to test it on their wireless network, and sure enough the same thing happened. For fixing this, people are suggesting that you change your network security to WEP, type in random numbers when it asks for the passcode, and then even though you see a prompt saying this is the wrong code, the wireless service starts up anyway. THERE HAS TO BE A BETTER WAY. AT&T said on Tuesday that it would no longer prevent customers with the Apple iPhone from using Internet telephone services [namely Skype] that bypass its own voice network. This follows the Verizon Wireless announcement that it will release an Android phone, and this will allow Google Voice. Pogue talks with Jobs; see's a "rebranding" of the Touch as a gaming device = wrong. I just listened to Pogue being interviewed by the CNBC gang. Pogue said he interviewed Jobs today. No talk about the iTablet. 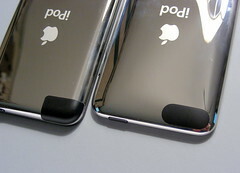 Pogue agreed with the CNBC commentator that Apple is afraid that a beefed up iPod Touch would cannibalize iPhone sales. Pogue agreed; I agree. Pogue then said that Apple is rebranding the iPod Touch as a gaming device. David, that campaign is about one year old. I've had two Touches. They're not gaming devices. Buggy software from the App Store, and poor controls. I'd get a Sony PSP if I wanted a portable gaming device. Pogue likes the video from the Nano. If the Apple handheld version of OS-X is going to be accepted as a viable computing platform, they will have to give up the protection of the iPhone. People want a full-function iPod Touch. That's what Apple didn't deliver today. It was good to see Steve Jobs up and about, and it was classy of him to pay tribute to the organ donor who provided his new liver. But, I think like a lot of other folks I was hoping for a video camera in the next gen iPod Touch. It looks like they just increased the memory of the top end model to 64 GB, and lowered the entry level 8 GB model to $199. I believe that the 32 GB and 64 GB models have the improved chipset, but I haven't been able to confirm this yet. I checked out the Gizmodo, and Engadget live blogging efforts, but I tuned in to Leo's TWiT live video stream and saw that he was watching gdgt. Instead of a video Touch, we see a new Nano (and a new iTunes 9 which doesn't interest me), which essentially has Apple entering a new market of compact video cameras such as the Flip devices. For $149 you can get the 8 GB model, but it's not hard to justify spending an extra $30 to get the 16 GB model. It provides 640 x 480, 30 fps video capture with sound. This will be a big seller, captivating the hearts of many including high schoolers to gym rats. Of course, the 9/09/09 date suggests a Beatles connection, and it's believed that we will hear that the Beatles portfolio of music will be made available on iTunes. What I'm more interested in is an update for the iPod Touch. I've had both versions one and two, being very much impressed with these handhelds for being able to access the Web and doing other things. iTunes: iTunes 9 with QuickTime X, 64-bit and maybe more of a social capability ala what gdgt is doing with their site. Cocktail: this provides the ability to buy not only music but also the album art, ringtones and liner notes. Finally a new iPod Touch (I don't care about a new Nano or Shuffle): video/still digital camera, 3Gs chipset, and 16/32/64 GB models. AT&T as a carrier has been a big disappointment, even though sales of the iPhone has been stellar. But to have a device such as the iPod Touch that will basically have all of the functionality of the iPhone without the hassle of monthly payments, will be most impressive, and I think will send this handheld and the Apple OS platform to new heights. I bought the 1G iPod Touch last month, but decided to upgrade to the 2G for twice the memory (16 GB) for the same price. I'm still within the refund period, so I'll be sending the 1G 8 GB iPod back for a refund. I'll take a hit on the restocking charge, though. 8 GB isn't enough for my needs, and this required me changing the settings everytime that I sync'ed. Restoring the backup from the 1G onto the 2G worked flawlessly, or as far as I can tell for now. I did cancel the Mobile Me trial, though. The only extra step necessary was entering the WPA password for my Wi-Fi network. Otherwise, all is fine. Even the apps were transferred to the new iPod, picking up where Ieft off in some games. The 2G now has a rounded back, a rocker switch for volume control, and a speaker which is only useful for alarms or system sounds. You can't really listen to an audiobook or song. The speaker seems to be buried inside with no outlet for the sound, so it has a kind of tinny, muffled quality. I took a series of photos that I uploaded to my Flickr account (click on the photo above), and I'll go into more depth about the differences as well as review some of the software that I've tried out from the Apple app store. There's quite a bit of useless-ware, but I found a few gems. I'll also try to review the medical software. Regarding gaming software, Apple is marketing this new generation as the "funnest" iPod. Some games work well but you can't compare it to the Sony PSP. UPDATE: I also needed to re-enter my e-mail account info, and login for Pandora. To Steve Jobs: why is your new online movie rental service locking up iTunes? You are now entering Betaville. Enough people are questioning your other announcement (the MacBook Air's battery can't be replaced by the user, single USB port, no RAM upgrade, etc. ), now I'm caught in a troubleshooting mess trying to play a movie rented via your iTunes. It seemed like the file was downloaded--it took about twenty minutes for the 2-hour movie, but every time I tried to play the movie, iTunes locked up. I had to use Windows Task Manager to close iTunes. Yes, I had upgraded to the latest version of iTunes, and I did reboot the PC more than once. I did contact support about this problem, so now I have to wait for some explanation and resolution. By way of Engadget, the bad news for potential MBA buyers is that the battery is sealed within the case. There's no idea yet how much this will cost to have a shop replace it when it dies. As they're saying on Engadget, it doesn't bode well for the road person who might need to replace an old battery in a pinch. I guess that's when you have to rely on your iPhone, which also has a non-removable battery.